Why do we move our clocks back in autumn? This last weekend the clocks went back 1 hour in the Disunited Kingdom. It is done on the night of the last Saturday/Sunday in October. We have switched from being on British Summer Time (BST) to being on Greenwich Mean Time (GMT). We will move them forward again by 1 hour on the night of the last Saturday/Sunday in March. In the United States, the clocks go back this coming weekend (the night of the 5/6 November), changing from e.g. Eastern Daylight Time (EDT) to Eastern Standard Time (EST), and they will go forward again on the night of the second Saturday/Sunday in March. Conversely, in e.g. Sydney (Australia), they moved their clocks forward (as they are in spring) in early October, and will move them back in early April. Whenever we change our clocks, I tend to get people asking me why we do this? This is asked by many people who have grown up here, but also by people who have come from countries like e.g. Nigeria or India or Saudi Arabia where they don’t change their clocks in spring and autumn. And, for the first time, my youngest daughter, who is now 15, asked me why we did it. So, here is my best attempt to explain it. It has to do with the varying length of the time between sunrise and sunset during the summer months and the winter months. And, in addition to this variation, trying to shift the time of sunset to a later time during the longer days of summer. The difference between what I will call “the length of the day” (what I really mean is the time between sunrise and sunset) varies most for places far from the Earth’s equator, and varies very little for places near the equator. To illustrate this, I have chosen four cities, Reykjavik (in Iceland), London (England), Lagos (Nigeria) and Cape Town (South Africa) which have differing latitudes. As you can see from the map below, Reykjavik is a long way from the equator (which, in this map, goes through e.g. Gabon, Congo Kinshasa, and Kenya), at a latitude of 64 degrees North. London is at a latitude of 53.5 degrees North. Lagos is close to the equator, at only 6.5 degrees North of it, and Cape Town is just outside of the tropics, at a latitude of 34 degrees South of the equator. The four cities marked are Reykjavik (Iceland), London (England), Lagos (Nigeria) and Cape Town (South Africa). Of these four cities, Reykjavik will have the biggest variation between the length of the day in late June and late December (the summer and winter solstices), and Lagos will have the smallest difference. Here is a table showing the length of time between sunrise and sunset on the summer and winter solstices for these four cities (to the nearest quarter of an hour). So, this shows how the length of the day varies between June and December, but why do we move our clocks in e.g. the Disunited Kingdom (or the USA), but not in e.g. Nigeria? Well, for countries nearer the equator, the variation in the length of the day is pretty small. For Lagos, the longest day is only 1 hour longer than the shortest day (12 hours 30 minutes compared to 11 hours 30 minutes). For London, the longest day is 16 hours and 30 minutes, the shortest only 8 hours, a difference of 8 and a half hours between the length of the day in June and the length of the day in December. In Reykjavik the difference is even more extreme. In late June the length of the day is 21 hours, whereas in late December it is only 4 hours and 15 minutes, a massive variation. Let us now look at what time the sun rises and sets in London on the longest day. It rises at 03:45 GMT, and sets at 20:20 GMT (8:20 PM). Most people are not in bed before about 10pm, and very few people are awake at 3:45 AM. Therefore, by shifting the clocks one hour forward we make the sunrise one hour later (4:45 AM), which is still before most people get up, and gain an hour of extra daylight in the evening instead, with the sun not setting until 9:20 PM, when most people are still awake to take advantage of it. There has been talk for as long as I can remember of having the Disunited Kingdom be on “double” British Summer Time during the summer months, and be on British Summer Time (GMT + 1 hour) during the winter months. This would mean that the sunrise in late June in London would be at 5:45 AM (still before most people get up), and sunset would be at 10:20 PM. That would be agreeable to a lot of people, but if we were on GMT + 1 hour in the winter months sunrise in late December would not be until after 9 AM, which I think most people would not like at all! 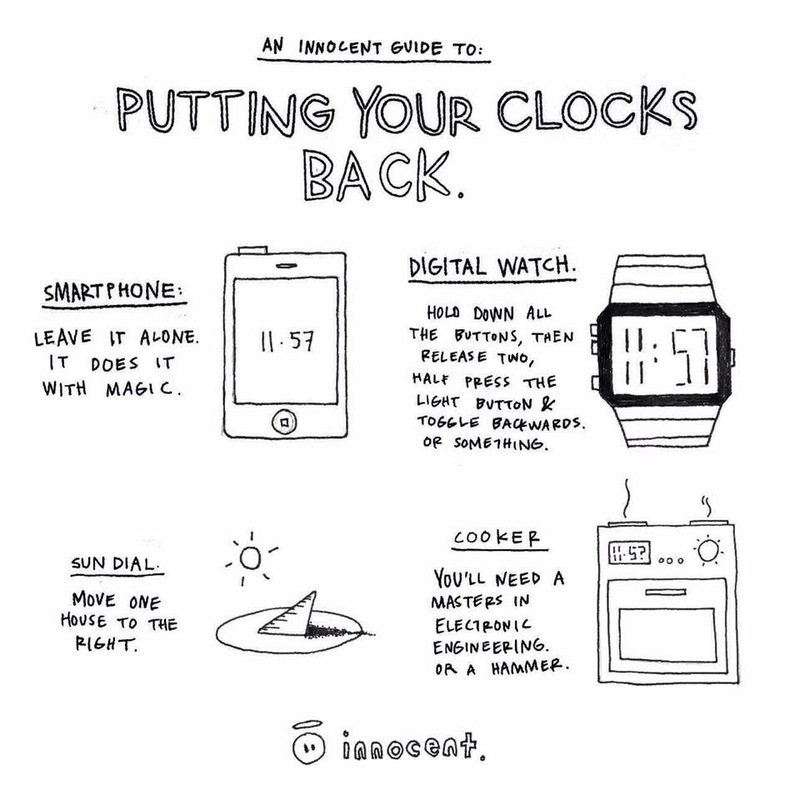 Of the four cities I have used in this illustration, only London changes its clocks. Reykjavik does not, and neither does Lagos nor Cape Town. I guess with Reykjavik, the days are so long in the summer months that it is light before anyone gets up and it is still light when most people go to bed. With Lagos, the change between longest day and shortest day is so short that it is pointless to change the clocks, but I was surprised to see that Cape Town does not utilise daylight saving. In fact, South Africa does not observe daylight saving. Surprisingly, Namibia, which is closer to the equator than South Africa, does observe daylight saving between early April and early September. Namibia seems to be the only country in southern Africa which observes daylight saving; Botswana, Zimbabwe, Mozambique, Malawi, Angola, Zambia and South Africa do not observe daylight saving. If you want to check whether a particular city observes daylight saving, and when the changes happen, you can follow this link. Does anyone know of any countries in Europe which do not move their clocks forward and back in spring/autumn? I know in the United States there are states which do not go on to Daylight Savings Time, e.g. Arizona and parts of Indiana. And, of course, Hawaii. Here is a map of the time zones in the world, centred on Greenwich Mean Time (GMT), as Greenwich is where zero of longitude is set. The country with the most time zones is, not surprisingly, Russia, as it extends from Europe all the way to eastern Asia, even further to the east than any part of Australia or Japan. Surprisingly for two countries which are so extended in an east-west direction, both China and India only have 1 time zone respectively. This means that if you live in e.g. Beijing your local sunrise will be about two hours earlier than if you live in a city in the west of China such as Aksu. And, there are parts of China which lie to the west of most of India, but these western parts of China are 2.5 hours ahead on the time used in the two countries (GMT+5.5 in India, GMT+8 in China). A map of the world’s time zones. The time is centred around Greenwich Mean Time (GMT), as Greenwich is the zero line of longitude on the Earth. This story in New Scientist Magazine caught my attention several weeks ago – “Hunting for Mars-like life a kilometre below Earth’s surface”. Here is a link to the original story. 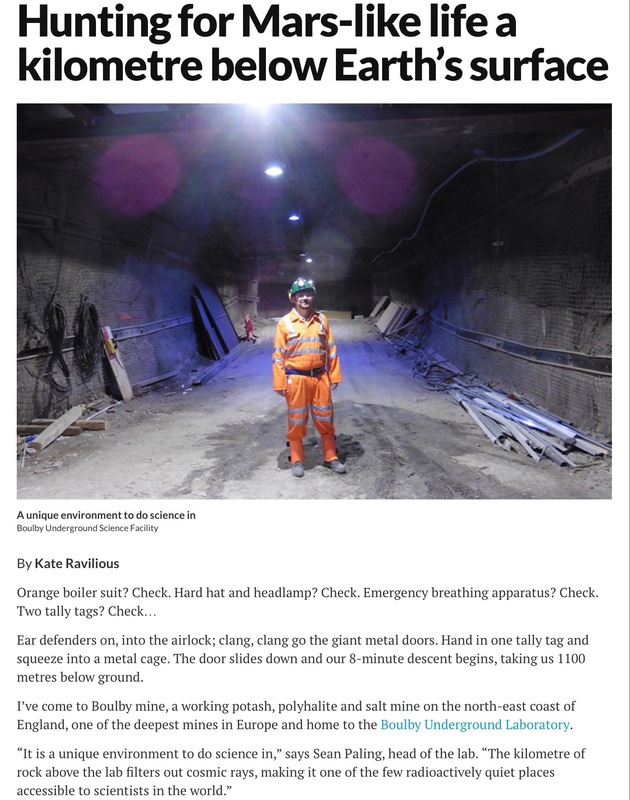 Scientists are using the extreme environment of Boulby mine, a working salt mine in north-east England to look for extremophiles, the kinds of organisms which are able to live (and even flourish) in environments which we human beings would simply find impossible. Scientists believe that the environment found in Boulby mine could be similar to environments found on Mars, so studying the extremophiles found deep underground in Boulby mine should help us in our quest to find evidence for life on other planets. This work will help NASA’s various rovers (both present and future ones) look in the most promising places for alien-life on the red planet. What is the scale height of water vapour in the Earth’s atmosphere? Someone recently asked me what was the scale height of water vapour in the Earth’s atmosphere, so I decided to see if I could find out. The scale height of water vapour is particularly important for infrared, sub-millimetre, millimetre and microwave astronomy, as it is the water vapour in the Earth’s atmosphere which prevents large fractions of these parts of the electromagnetic spectrum from reaching the ground. This is why we can, for example, only study the Cosmic Microwave Background from space or from a few particularly dry places on Earth such as Antarctica and the Atacama desert in Chile. What does the term ‘scale height’ mean? where is Boltzmann’s constant, is the temperature (in Kelvin), is the mass of the molecule and is the value of the acceleration due to gravity. If we were to plot the atmospheric pressure as a function of altitude we find that it follows an exponential, this is because of the differential equation which produces Equation (1) above (I will go into the mathematics of how Equation (1) is derived in a separate blog). In the case of air, which is some 80% nitrogen molecules and 20% oxygen molecules, the scale height has been well determined and is (or, to put it another way, it drops by a half every ). So, if one were at an altitude of , half of the atmosphere would be below you. Go up another and it drops by a half again, so at 75% of the atmosphere is below you. Determining the scale height of water vapour in the Earth’s atmosphere is, I have discovered, essentially impossible. Or, to put it better, it is a meaningless figure. This is because it varies too much. It depends on temperature, so even in a given place it can vary quite a bit. So, instead, we talk of precipitable water vapour (PWV) at a particular place (both location and altitude). PWV is the equivalent height of a column of water if we were to take all the water vapour in the atmosphere above a particular location and it were to precipitate as rain. The Mount Abu Infrared Observatory in India, for example, is at an altitude of 1,680 metres, and quotes a PWV of 1-2mm in winter. The PWV would be higher in summer, as water sinks in the atmosphere when it is cold. For Kitt Peak in Arizona, which is at an altitude of 2,090 metres, the PWV varies between about 15mm and 25mm. This is why very little infrared astronomy is done at Kitt Peak. For Mauna Kea in Hawaii, which is at an altitude of just over 4,000 metres, it varies between 0.5mm and 2mm. This is why there are a number of infrared, sub-mm and millimetre wave telescopes there. At the South Pole, which is at an altitude of 2,835 metres, the PWV is measured to be between 0.25 and 0.4 in the middle of the Austral winter (June/July/August). Why is this so much lower than Mauna Kea, even though it it is at a lower altitude? It is because it is so much colder. The average Precipitable Water Vapour at the South Pole averaged over a 50-year period from 1961 to 2010. Even in the Austral summer it is low, but in the Austral winter (June/July/August) it drops to as low as 0.25 to 0.35mm, one of the lowest values found anywhere on Earth. High in the Atacama desert, on the Llano de Chajnantor (the Chajnantor plateau), which is at an altitude of 5,000 metres and where ALMA and other millimetre and microwave telescopes are being located, the PWV is typically about 1mm, and drops to as low as 0.25mm some 25% of the time (see e.g. this website). This is why Antarctica and the Atacama desert (in particular the Chajnantor plateau) have become places to study the Cosmic Microwave Background from the Earth’s surface; we need exceptionally dry air for the microwaves to reach the ground. To summarise, it is meaningless to talk about a scale height for water vapour in the Earth’s atmosphere, as the vertical distribution of water vapour not only varies from location to location, but varies at a given location. So, instead, we talk about Precipitable Water Vapour (PWV); the lower this number the drier the air is above our location. To be able to do infrared, sub-millimetre, millimetre and microwave astronomy we need the PWV to be as low as possible, the best sites (Antarctica and the Atacama) get as low as 0.25mm and are usually below 1mm. The exceptionally dry air above Antarctica and the Atacama desert enable us to study the Cosmic Microwave Background from the ground, something we usually have to do from space. A few years ago I blogged about a list in The Observer newspaper of the 10 best physicists. 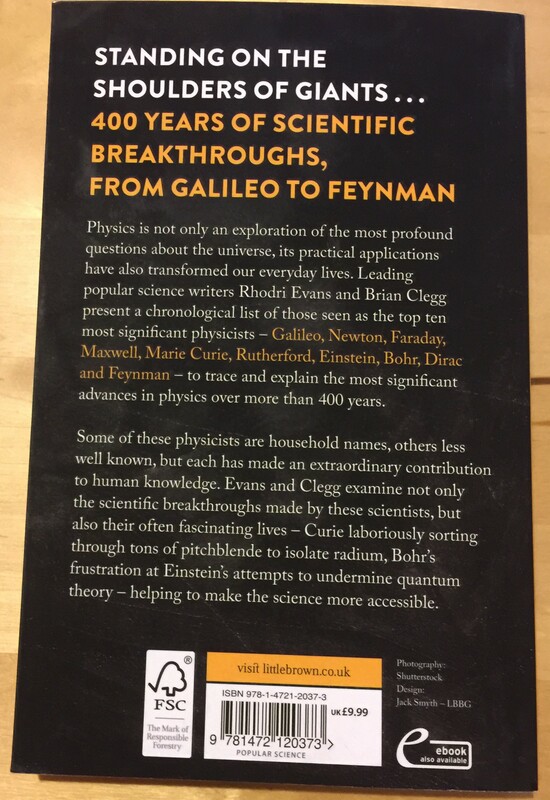 I felt it would be nice to write an up to date book about the greats in physics, and this list was as good as any. After enlisting the help of Brian Clegg, we set about writing a book with a chapter about each of the 10 physicists in The Observer’s list, along with a discussion in the last chapter as to whether we would choose the same 10. 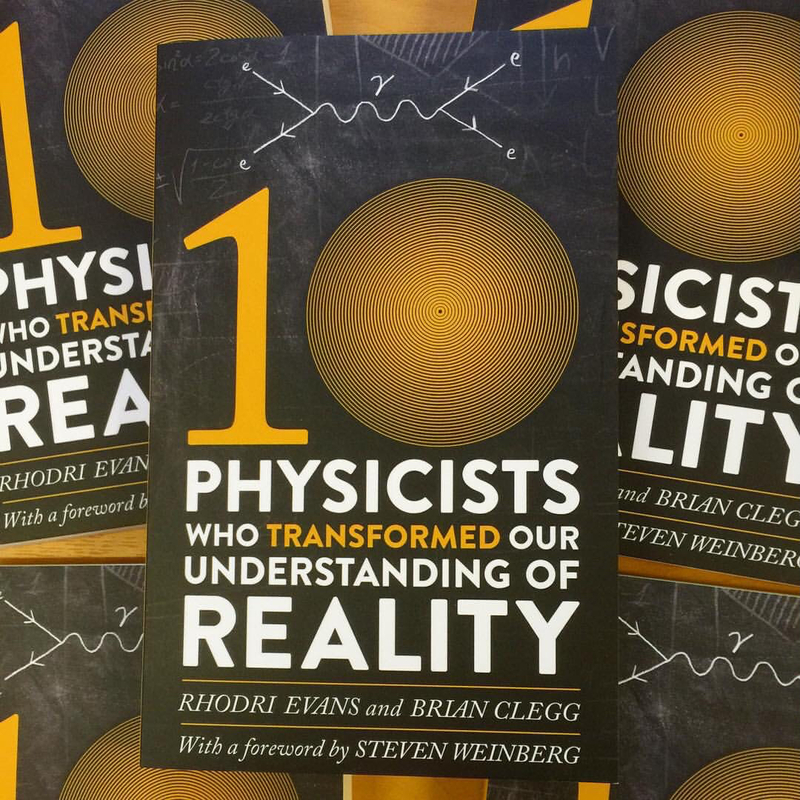 We agreed that nearly all physicists would include 4 names in their own list of the top 10 (buy the book to find out which 4! ), but that the other 6 were much more subjective. Neither of us would have chosen the same 10 as are in this list. We quickly realised that it would not be possible to write about e.g. Niels Bohr before writing about Ernest Rutherford, as Bohr’s work was based on the model of the atom which Rutherford introduced. The same is true of many others, including Isaac Newton, whose famous laws of motion were based on work that Galileo had done. How do we know that the CMB is from a hot, early Universe? Towards the end of July I had an article published in The Conversation about the Cosmic Microwave Background, follow this link to read that article. After the article had been up a few days, I got this question from a Mark Robson, which I thought was an interesting one. Mark Robson’s original question which be posed below the article I wrote for The Conversation. I decided to blog an answer to this question, so the blogpost “What is the redshift of the Cosmic Microwave Background (CMB)?” appeared on my blog on the 30th of August, here is a link to that blogpost. 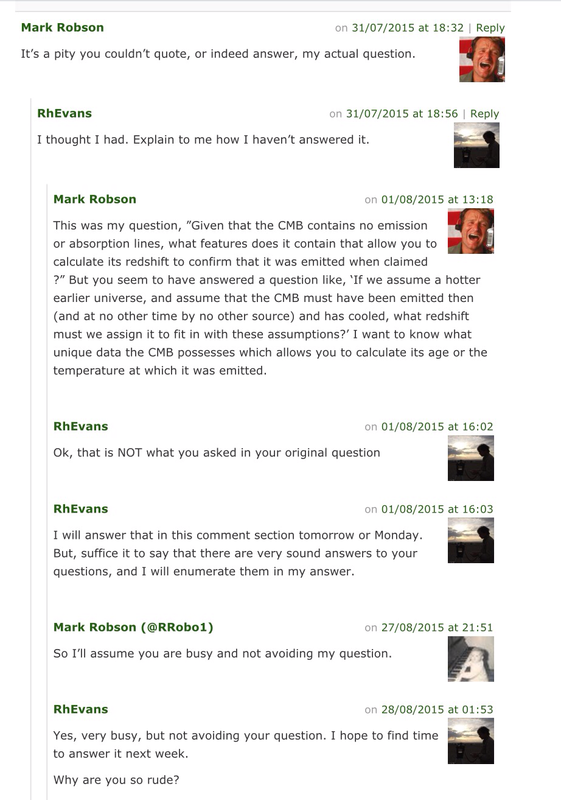 However, it would seem that Mark Robson was not happy with my answer, and commented that I had not answered his actual question. So, here is his re-statement of his original question, except to my mind he has re-stated it differently (I guess to clarify what he actually meant in his first question). I said I would answer this slightly different/clarified question soon, but unfortunately I have not got around to doing so until today due to various other, more pressing, issues (such as attending a conference last week; and also writing articles for an upcoming book 30-second Einstein, which Ivy Press will be publishing next year). What is unique about the CMB data? 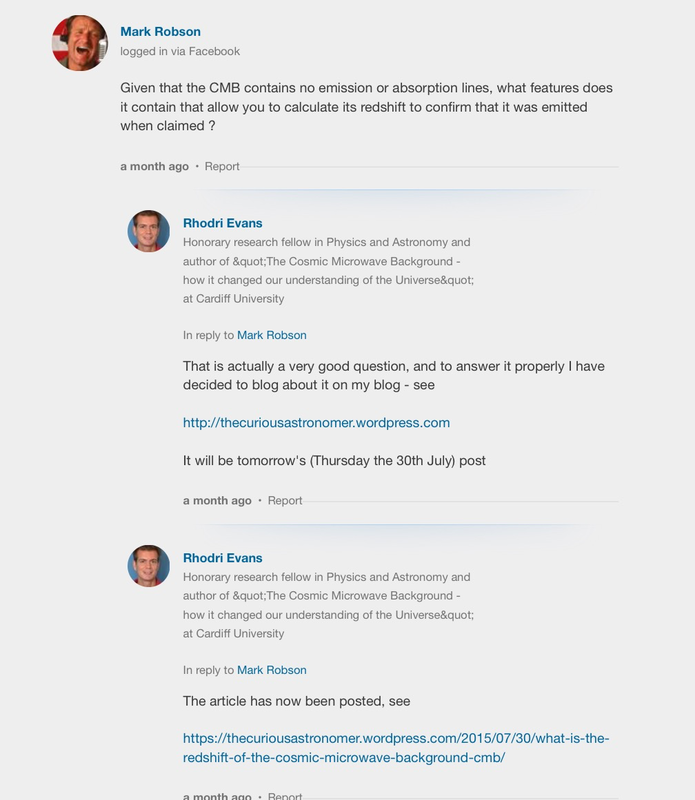 The very quick answer to Mark Robson’s re-stated question is that “the unique data possessed by the CMB which allow us to calculate its age or the temperature at which it was emitted” is that it is a perfect blackbody. I think I have already stated in other blogs, but let me just re-state it here again, the spectrum as measured by the COBE instrument FIRAS in 1990 of the CMB’s spectrum showed it to be the most perfect blackbody spectrum ever seen in nature. 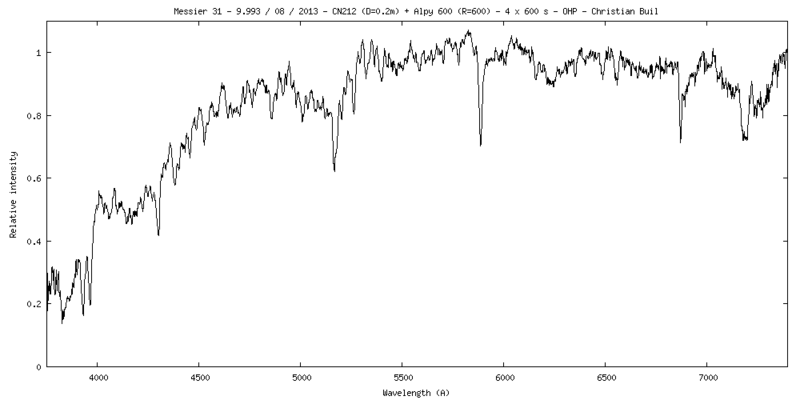 Here is the FIRAS spectrum of the CMB to re-emphasise that. So, we know, without any shadow of doubt, that this spectrum is NOT due to e.g. distant galaxies. Let me explain why we know this. If we look at the spectrum of a nearby galaxy like Messier 31 (the Andromeda galaxy), we see something which is not a blackbody. Here is what the spectrum of M31 looks like. The spectrum differs from a blackbody spectrum for two reasons. First of all, it is much broader than a blackbody spectrum, and this is easy to explain. When we look at the light from M31 we are seeing the integrated light from many hundreds of millions of stars, and those stars have different temperatures. So, we are seeing the superposition of many different blackbody spectra, so this broadens the observed spectrum. Secondly, you notice that there are lots of dips in the spectrum. 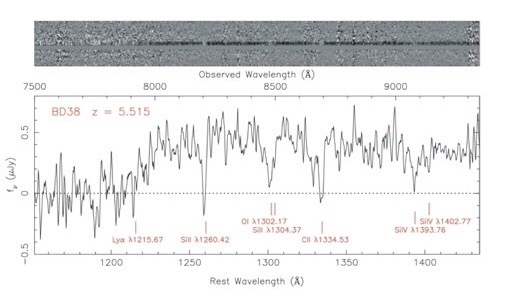 These are absorption lines, and are produced by the light from the surfaces of the stars in M31 passing through the thinner gases in the atmospheres of the stars. We see the same thing in the spectrum of the Sun (Josef von Fraunhofer was the first person to notice this in 1814/15). These absorption lines were actually noticed in the spectra of galaxies long before we knew they were galaxies, and were one of the indirect pieces of evidence used to argue that the “spiral nebulae” (as they were then called) were not disks of gas rotating around a newly formed star (as some argued), but were in fact galaxies outside of our own Galaxy. Spectra of gaseous regions (like the Orion nebula) were already known to be emission spectra, but the spectra of spiral nebulae were continuum spectra with absorption lines superimposed, a sure indicator that they were from stars, but stars too far away to be seen individually because they lay outside of our Galaxy. 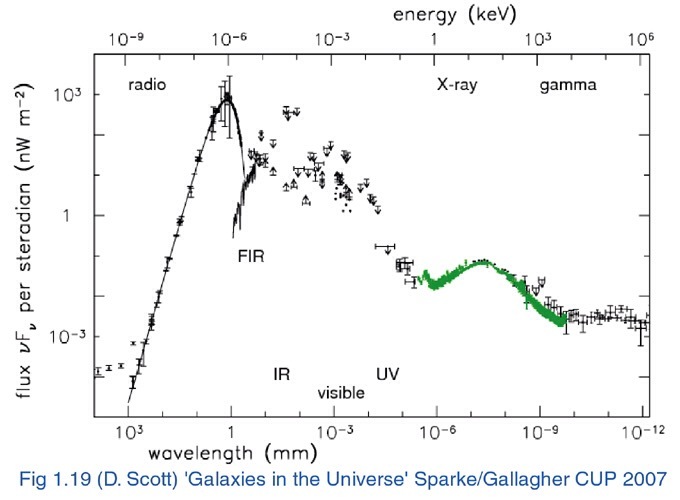 The absorption lines, as well as giving us a hint many years ago that we were seeing the superposition of many many stars in the spectra of spiral neublae, are also very useful because they allow us to determine the redshift of galaxies. We are able to identify many of the absorption lines and hence work out by how much they are shifted – here is an example of an actual spectrum of a very distant galaxy at a redshift of , and below the actual spectrum (the smear of dark light at the top) is the identification of the lines seen in that spectrum at their rest wavelengths. Some galaxies show emission spectra, in particular from the light at the centre, we call these type of galaxies active galactic nucleui (AGNs), and quasars are now known to be a particular class of AGNs along with Seyfert galaxies and BL Lac galaxies. These AGNs also have spectral lines (but this time in emission) which allow us to determine the redshift of the host galaxy; this is how we are able to determine the redshifts of quasars. 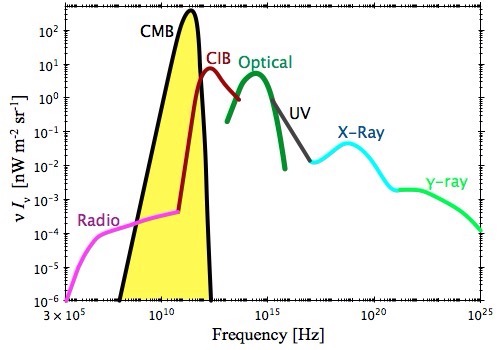 Notice, there are no absorption lines or emission lines in the spectrum of the CMB. Not only is it a perfect blackbody spectrum, which shows beyond any doubt that it is produced by something at one particular temperature, but the absence of absorption or emission lines in the CMB also tells us that it does not come from galaxies. Here is a cartoon (from Andrew Jaffe) which shows the various components of the EGBL. I won’t go through every component of this plot, but the UV, optical and CIB (Cosmic Infrared Background) are all from stars (hot, medium and cooler stars); but notice they are not blackbody in shape, they are broadened because they are the integrated light from many billions of stars at different temperatures. The CMB is a perfect blackbody, and notice that it is the largest component in the plot (the y-axis is what is called , which means that the vertical position of any point on the plot is an indicator of the energy in the photons at that wavelength (or frequency). The energy of the photons from the CMB is greater than the energy of photons coming from all stars in all the galaxies in the Universe; even though each photon in the CMB carries very little energy (because they have such a long wavelength or low frequency). Why are there no absorption lines in the CMB? If the CMB comes from the early Universe, then its light has to travel through intervening material like galaxies, gas between galaxies and clusters of galaxies. You might be wondering why we don’t see any absorption lines in the CMB’s spectrum in the same way that we do in the light coming from the surfaces of stars. The answer is simple, the photons in the CMB do not have enough energy to excite any electrons in any hydrogen or helium atoms (which is what 99% of the Universe is), and so no absorption lines are produced. However, the photons are able to excite very low energy rotational states in the Cyanogen molecule, and in fact this was first noticed in the 1940s long before it was realised what was causing it. Also, the CMB is affected as it passes through intervening clusters of galaxies towards us. The gas between galaxies in clusters is hot, at millions of Kelvin, and hence is ionised. The free electrons actually give energy to the photons from the CMB via a process known as inverse Compton scattering, and we are able to measure this small energy boost in the photons of the CMB as they pass through clusters. The effect is known as the Sunyaev Zel’dovich effect, named after the two Russian physicists who first predicted it in the 1960s. We not only see the SZ effect where we know there are clusters, but we have also recently discovered previously unknown clusters because of the SZ effect! I am not sure if I have answered Mark Robson’s question(s) to his satisfaction. Somehow I suspect that if I haven’t he will let me know!